We’re proud to announce our partnership with Mecademic to become a key distributor of the Meca500 robot in Ireland. 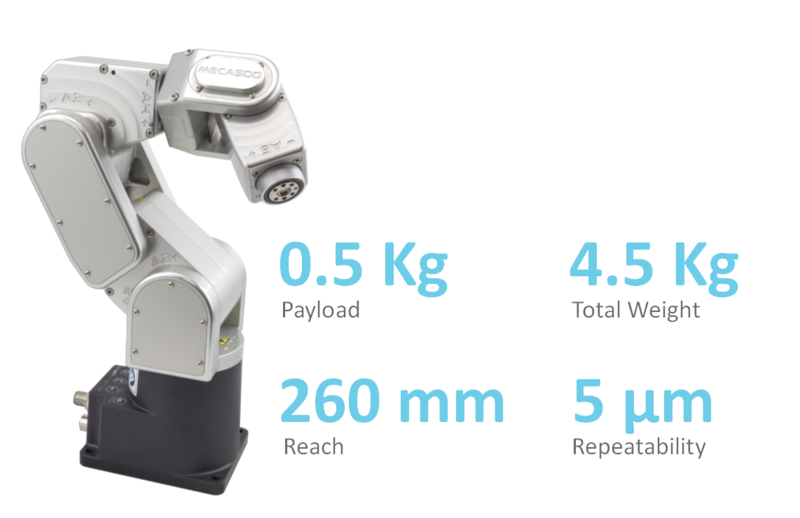 As the smallest and most precise six-axis industrial robot arm on the market, the Meca500 represents a new generation of industrial robots. Weighing just 4.5 Kg’s the Meca500 is light and agile. Its compact size makes it especially useful for applications where a small machine footprint made the integration of a standard industrial robot practically impossible. The arm controller is integrated into the base of the robot, saving space and simplifying the operation of the robot. As factories continue to expand, the Meca500 is a perfect solution for automating within a confined space. The Meca500 boasts a position repeatability of 0.005mm and path accuracy of 0.1mm. These figures will challenge any robot manufacturer and make the Meca500 one of the best in its class. The robot is equipped with a zero-backlash speed reducer and high-resolution encoders offering seemless movement making the robot perfect for the precise and delicate manipulation of small parts. The Meca500 is a plug-and-work automation component offering great flexibility and simplicity. A programming package is not required as all programming and configuration functions are accessible via a web interface. This includes an option to import CAD models for motion simulations which simplify and enhance the programming experience. PLC or PC integration is seamless. Socket messaging over TCP/IP or the powerful EtherCAT interface allow exchange of all available robot commands and feedbacks. Safety integration on the Meca500 is simple to implement. The robot features a 24V supply voltage and Cat.3/PL d performance safety compliance. Additional brake release buttons are useful for robot recovery and position adjustment. With a maximum of 25 pound force generated by the robot, the risks of injuries and damage to the equipment is very low. An electric two-finger gripper can be integrated into the arm of the robot and controlled directly from the robot controller. The gripper offers the functionality of opening and closing the fingers of the gripper while controlling the speed and measuring the force exerted. If you’re interested in learning more about the Meca500 or applying this technology to your next manufacturing challenge, contact a member of our team today.